Its raining umbrellas on Greenworldinvestor Yesterday, I wrote about the Solar Umbrella and today I am going to talk about Ulta Chhata or the Inverted Umbrella project. The mission was launched in 2015 by a Mumbai based couple formally called ThinkPhi, to solve the scarcity of water and lack of electricity. The Ulta Chhata can be used for different purposes like supplying clean water to schools and colleges, charging electric vehicles or providing shade canopies to toll plazas, highways, railways, and metros. The Ulta Chaata as the name suggests is an inverted canopy that can harvest and filter up to 85,000 liters of water and solar capacity of 1.5 KW. 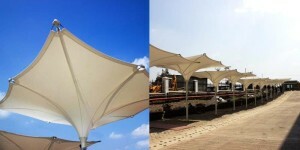 The canopy uses solar power to filter the water making it fit for drinking purpose. These inverted umbrellas are built in clusters and controlled by one phi box, the central operating system. The whole structure weighs 100 kg and its canopy measures 4m x 4m and comes with a price tag of one lakh. They also come with a 15-year warranty. The latest version of the inverted umbrella, model 1080 XL can generate over 40 KW of solar power on a single charge and filter over 1 million liters of rainwater. Larger sizes can harvest more water when it rains and captures more solar energy. Excess water can be stored in tanks to be used later, likewise, any extra energy can be fed to the grid. The Ulta Chhata could be the answer to our country’s growing problems of power and water. ThinkPhi has already sold over 200 units and is targeting to launch many more energy efficient products. Next, the company is looking at designing smart bins that tackle home waste generation. We must applaud the brains behind this idea of taking the humble umbrella used to protect us from rains to great heights and conserve the rains.